All transactions are safe and secure with a reliable history in online purchasing behind each of our associates. Buy the Authentic Big Lebowski Bowling Shirt Replica to own Big Lebowski clothing and merchandise. This authentic replica jersey is great for costume parties or a night out bowling. 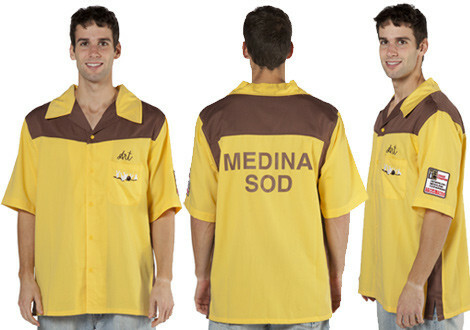 The back of this Big Lebowski bowling shirt reads, "Medina Sod," while the front is identical to the look of the team's bowling shirts from the movie. Buy them for your own team and tell everybody that you beat Jesus Quintana. Just remember to remind the league that under no circumstances do you ever bowl on Shabbas. They'll have to reschedule. In addition to the Authentic Big Lebowski Bowling Shirt Replica above, browse the Big Lebowski Clothing Gallery for more apparel like men's and women's clothes, kids shirts or hoodies.